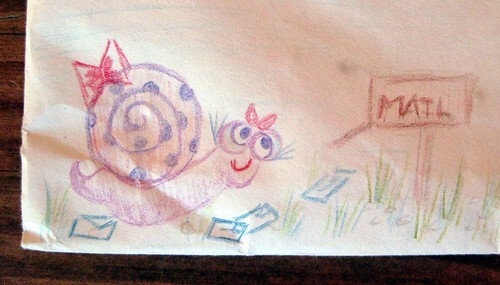 Quite a while back I did a swap on Swap-bot called "Snail Mail :]." 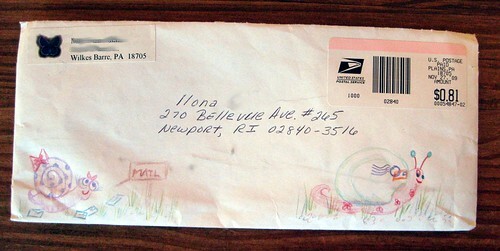 I blogged about my own offerings at the time, but did end up responding to one of the swapped envelopes I got. 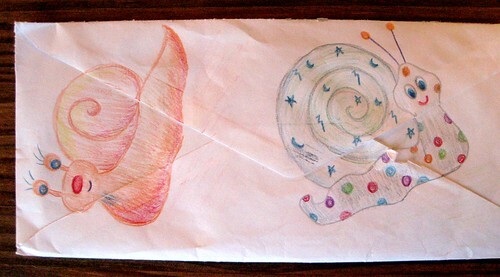 The idea was to decorate the envelope with many snails, and I was really touched by the hand-drawn snails on this one. ...and I found them delightful. 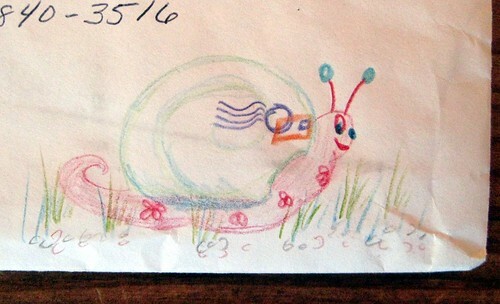 thats a cute snail. I love it. they are so cute !!! I love em too , thanks for sharing . Gotta love perky, happy slime-free snails! hey i just came across 2 unopened packs of these dated 1979 and looking to sell on ebay. how much did you buy yours for if you dont mind me asking? 1. This was received, not sent, so obviously I didn't buy anything. 2. This is handmade. There's no such thing as an unopened pack of a hand-drawn original.